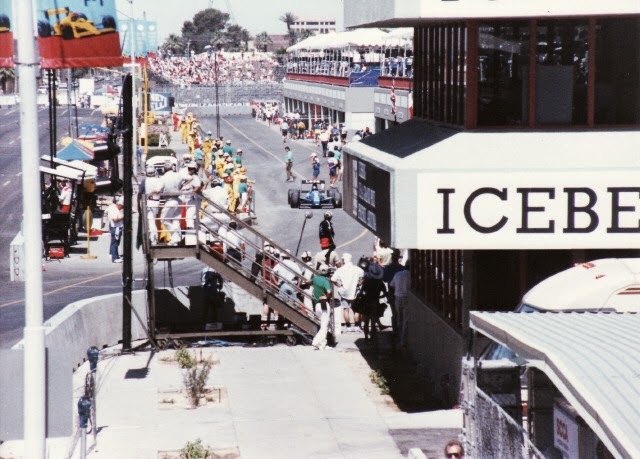 It's amazing to believe that today marks the 25th Anniversary of the inaugural Iceberg GP held upon the Downtown city streets of Phoenix, Arizona - which was also your humble No Fenders scribe Tomaso's debutant Formula 1 race; Aye Karumba! And whilst my memories slip away, nevertheless I can still vaguely recall standing in the middle of the concrete canyon, nee jersey barrier lined streets in the sweltering HEAT of 104-degrees f (Fahrenheit) holding a Foster's "Oil Can" in hand while watching the FREAKIN' COOLEST CARZ on the planet shriek by! Nigel Mansell, Nelson Piquet, Alain Prost and Ayrton Senna. Michele Alboreto, Rene Arnoux, Gerhard Berger, Thierry Boutsen, Johnny Herbert, Alesandro Nannini and Riccardo Patrese. Martin "BillyBob" Brundle, Ivan Capelli, Eddie "THE MOUTH" Cheever, Yannick Dalmas, Bertrand "Pepper Spray" Gachot, Mauricio "Big Mo" Gugelmin, 'lil "Stevie Johnson," (Stefan Johansson) Roberto Moreno, Bernd Schneider, Aguri Suzuki and Derek Warwick. As I won't try recalling I-T all, especially since I've already sribbled my sentiments in the following; (story below) and although I thought it was that very same race, I've now discovered via Al Gore's wondrous invention, Zed Internetz; Hya! 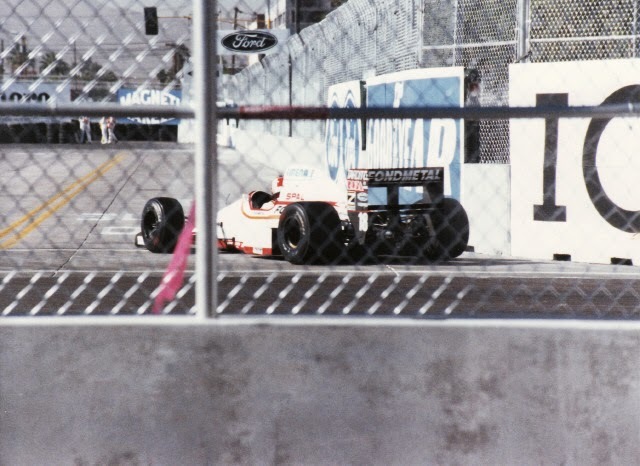 That apparently the World Famous Chandler Ostrich Festival which hosted some 70,000 attendees, vastly overshadowing the Grand Prix's attendance was actually in 1990. As the festival occurs in early March each year, albeit having begun in 1989. And while I've just read of how 'Ol "Arrogant" (Ayrton Senna) never looked back, instead always focusing forwards, while in the midst of all my reminiscing over Black Sunday, etc, I find myself thinking how do today's pantheon of five Formula 1 world champions stack up in stature to those four legendous' world champions I had the very good fortune of witnessing in the flesh a quarter century ago? And out of the 39-drivers entered that weekend, as recall that this was the era of Pre-qualifying, where thirteen drivers had to fight it out for four spots to advance to qualifying, where the slowest four drivers would be eliminated, as only 26-entries were allowed, as apparently the combination of the heat plus brand new engine formulae saw only six cars classified at the end of the race, with 19 retirements and Mauricio Gugelmin being disqualified. thus, imagine such a thing today, where reportedly Lotus has failed to pay its Renault engine bills and the "little-teams" are feeling left out in their struggles to progress, unable to compete financially while even Sauber has claimed that the Ukraine situation has stopped negotiations with potential sponsors, as former F1 team owner Eddie Jordan has just publicly advised Peter Sauber to sell his team, while rumours abound over Tony Fernandes planning to sell Caterham. Thus, of those 39-men, paired down to twenty-six taking the green flag, nine would go onto lengthen their respective Open Wheel careers by moving Stateside to compete in the CART/PPG IndyCar series, with one becoming champion while another would even get to drink the milk at the Speedway during one of Indy Car's darker periods simply known as "The Split!" Michele Alboreto, Eddie Cheever, Christian Danner, Gregor Foitek, Mauricio Gugelmin, Stefan Johansson, Nigel Mansell, Roberto Moreno and Nelson Piquet. As "Il Lione," Bloody 'Nige or simply Nigel Mansell, the 1992 F1 world champion made history by becoming the first and only driver to win the (CART/PPG) IndyCar championship the following season when unexpectedly jumping "Across-the-Pond" to race in America in 1993, as Mansell also claimed Rookie Of the Year honours and tallied up five wins in American Open Wheel Racing before returning to Williams to help offset the mighty blow of Ayrton Senna's death in Formula 1. Will forever remember Eddie Cheever affectionately as "Eddie Who?" To which my local grocery store clerk retorted after I'd reluctantly told him who'd won the 1998 Indy 500 race... Undoubtedly Cheever's crowning achievement in motor racing, as Cheever would ultimately tie Mansell for victories with five, but little else! Actually witnessed one of Roberto Moreno's two CART victories Up North Eh! At the Vancouver (BC) Molson Indy 'Wayback a decade-plus ago, with the affable Brazilian wafting us with humongous clouds 'O tyre smoke a la Zanardi "victory doughnuts" directly in-front of our seats on his cool down lap! Although Moreno has the dubious honour of being 'DER TERMINATOR'S short-lived replacement "trade" driver at Jordan Grand Prix after Michael Schumacher was poached from 'EJ's grasp to the Benetton team instead, and the rest as they say, is history. 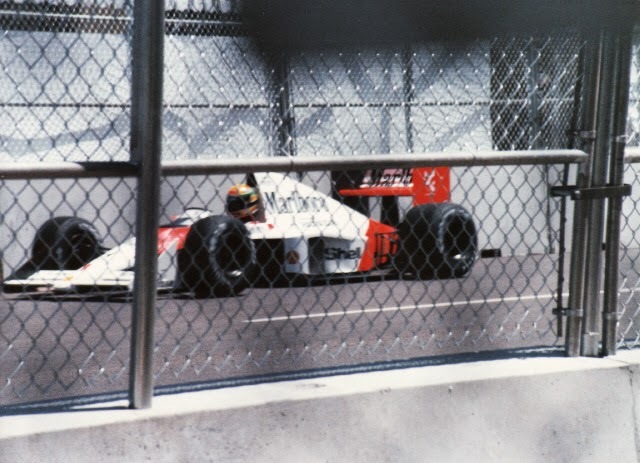 Also winning on the streets of Vancouver, BC was 'Big Mo, aka Mauricio Gugelmin, who drove for my Home-team's Pacwest Racing, as it would be Gugelmin's lone victory in CART while another ex-Formula 1 driver named Mark Blundell, as Mauricio's team-mate racked-up a further three victories for the team's best season results. Other notable Alumni of our 1989 Phoenix GP class found success in the world of Sports Cars, most notably being Yannick Dalmas of France, who after an unheralded F1 career went onto win le 24 Heurs du Mans four times: 1992, 1994-95, 1999, for four different teams. Bernd Schneider, who suffered a humiliating time in F1, failing regularly to escape Pre-qualifying, went onto major success in the DTM German Touring Car series, notching an amazing five championship titles for Mercedes: 1995, 2000-01, 2003, 2006 along with taking the FIA GT championship in 1997. Martin Brundle got the nickname "BillyBob" from his days racing in the IROC series Stateside, where I believe he even won a round of the series during the era when such luminaries as 'Ol Ironhead (Dale Earnhardt) and 'lil Al (Unser Jr.) were regular contestants. And while Brundle's F1 career was star-crossed, he went onto win the 1988 World Sports Car championship along with the 1990 24 Heurs du Mans. Johnny Herbert, who suffered horrendous foot injuries in single seater racing went onto prominence as a Sports Car Ace, winning the American Le Mans Series (ALMS) along with numerous outings at Circuit de la Sarthe, even winning the race 'Wayback in 1991; along with being Michael Schumacher's team-mate at Benetton where he won his first two Grand Prix's, before scoring the 'Wee Scot's (Jackie Stewart) Stewart Grand Prix only F1 win. Aguri Suzuki was Japan's very first driver to ever stand upon the podium in Formula 1, scoring his lone (podium) third place finish memorably at Suzuka, the Honda owned race circuit of which had helped the Japanese driver crack the Formula 1 grid, albeit Aguri's Lola LC90 chassis was powered by the rival auto maker Chrysler's Lamborghini V-12 that day in 1990, a feat only equaled twice more in F1 to date, although Suzuki's accomplishment was overshadowed by Ayrton Senna's ramming of Alain Prost to win his second world championship! 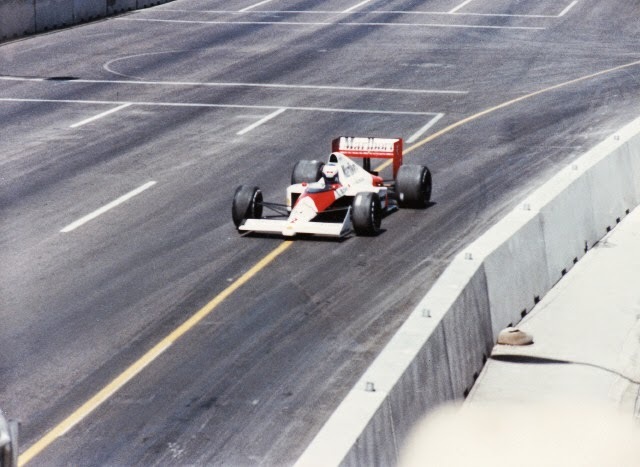 While Stefan Johansson will forever be known as 'lil "Stevie Johnson" thanks to Randal "thy Moniker King" who came up with this clever name during our halcyon days during the yearly Portland IndyCar races. While I'd forgotten that Messer Bertrand "Pepper Spray" Gachot had won the 1991 24 Heurs du Mans alongside Johnny Herbert and Volker Weidler aboard the Mazda 787B, the only Japanese car to ever win the epic endurance race to date. As this was ultimately Gachot's crowning achieving in motor racing, as his F1 career came spiraling downwards shortly afterwards when he spent four months in jail for spraying a "Cabbie" with CS gas, which enabled some then unknown German driver named Michael Schumacher to make his Formula 1 debut at the Belgian Grand Prix! And thus it's hard to believe that we've come somewhat full circle, since 1989 was also the first year of the mandatory 3.5-liter normally aspirated era after the turbo's had simply gotten too exotic, nee expensive as the major auto manufacturers raced to increase their horsepower to dizzying heights - passing the 1,000bhp threshold! Since it's funny how the pendulum has swung the other way, going to smaller displacement turbocharged Power Units to entice auto manufacturers to return back to Formula 1. Yet 25yrs ago there were six-engine producers whose powerplant's varied between eight, ten and twelve cylinders, with the likes of Ferrari and Lamborghini supplying V-12's, Honda and Renault supplying V-10's, with Ford and Judd supplying the rest of the grid with V-8's. On a trivial note, over the past Quarter-century only four engine manufacturers have powered their respective teams to the Constructor's title. (12) Renault: 1992-97, 2005-06, 2010-2013; (8) Ferrari: 1999-2004, 2007-08; (3) Honda: 1989-1991; 2) Mercedes Benz: 1998, 2009. While these winning engines have featured four maximum cubic inch/liter volume displacements, with all being normally aspirated. (12) 1994-2005: 3.0 V-10; (8) 2006-13: 2.4 V8; (4) 1989-90, 1992-93: 3.5 V-10; (1) 1991: 3.5 V-12. Arguably, Y'all could say that the most successful driver came out of this period, since in the past 25yrs we've had a total of twelve men becoming world champions, interestingly split equally down the middle between single and multi-year titlists, as 'DER TERMINATOR, nee Michael Schumacher leads the trophy haul, while two others became four-times world champions, etc. (7) Michael Schumacher, Germany: 1994-95, 2000-04; (4) Sebastian Vettel, Germany: 2010-13; (4) Alain Prost, France: 1985-86, 1989, 1993; (3) Ayrton Senna, Brazil: 1988, 1990-91; (2) Fernando Alonso, Spain: 2005-06; (2) Mika Hakkinen, Finland: 1998-99. Nigel Mansell, Great Britain: 1992; Damon Hill, Great Britain: 1996; Jacques Villeneuve, Canada: 1997; Kimi Raikkonen, Finland: 2007; Lewis Hamilton, Great Britain: 2008; Jenson Button, Great Britain: 2009. Basically only two nations have won the coveted Constructor's crown over this time period divided between six teams, as although reigning Quadruple champion Red Bull runs under an Austrian license, it's based in Milton Keynes in Bloody 'Ol England in the former Jaguar premises'; ditto for Renault, which is obviously French, yet they simply bought the Benetton team which resided in Enstone (England) before being sold again to today's revamped Lotus concern. With the likes of Williams, McLaren, Brawn and Benetton also being located in the UK, whilst just Scuderia Ferrari is the lone outsider from Italy. (8) Scuderia Ferrari, Italy: 1999-2004, 2007-08; (5) Williams, Great Britain: 1992-94, 1996-97; (4) Red Bull, Austria: 2010-13; (4) McLaren, Great Britain: 1989-91, 1998; (2) Renault; France, 2005-06; (1) Brawn, Great Britain: 2009; (1) Benetton, Great Britain: 1995. While I've previously scribbled 'bout how the greatest Chief Designer of this era is without question Adrian Newey, whose chassis have won 10 Constructor's championships for Williams, McLaren and Red Bull, along with 10 world championships for the likes of Nigel Mansell, Alain Prost, Damon Hill, Jacques Villeneuve, Mika Hakkinen and Sebastian Vettel; Aye Karumba! While the second most winning Designer of this period is a bloke from South Africa named Rory Byrne whose genius was exploited to provide Michael Schumacher, Benetton and Ferrari their multiple titles with Byrne notching up seven Drivers and Constructors titles apiece.